President Donald Trump has received a lunchtime briefing on the government’s response to wildfires in California. White House spokeswoman Lindsay Walters says Agriculture Secretary Sonny Perdue also briefed Trump and Vice President Mike Pence on a wildfire prevention roundtable he participated in Monday. Trump has declared a state of emergency in the state and ordered federal agencies to help with the efforts. She also says the White House “extends its thoughts and prayers” to everyone affected by the fires that have been tearing through Southern California. Authorities have issued new alerts about unhealthy air from smoke and ash sent up by a growing Southern California wildfire. Richard Sanchez, a manager at Jeannine’s American Bakery Restaurant in the foothill enclave of Montecito, says customers are coming in Monday wearing masks. He says smoke is so thick that visibility is down to a few feet and a layer of ash is coating the streets. Regulators are warning people in parts of Santa Barbara, Ventura and Los Angeles counties to stay indoors, avoid vigorous outdoor activities and not do anything to stir up ash. Even residents of Montecito and neighboring Carpinteria who aren’t under evacuation orders have opted to leave because of the thick blanket of smoke. A growing Southern California wildfire is threatening the wealthy seaside enclave of Montecito, where celebrities have evacuated estates perched on hillsides below heavy flames. Talk show host Ellen DeGeneres said on Twitter that neighbors were helping each other and their animals get to safety. She said she was proud to be a part of the small, exclusive community in Santa Barbara County northwest of Los Angeles. Retired tennis star Jimmy Connors tweeted that his property was in danger. Many residents of Montecito and neighboring Carpinteria not under evacuation orders have opted to leave because of heavy smoke and ash blowing through. 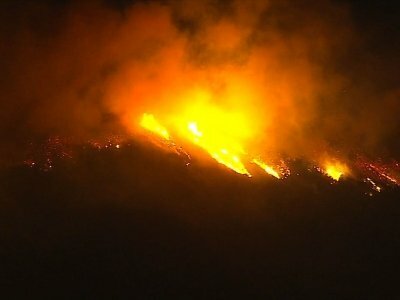 Crews aided by calm overnight winds kept a wall of flames from descending from mountains into coastal towns after a huge Southern California wildfire exploded in size over the weekend. Thousands remain under evacuation orders Monday as the fire churns west through foothill areas of Carpinteria and Montecito, Santa Barbara County seaside towns about 75 miles (120 kilometers) northwest of Los Angeles. Much of the fire’s new growth occurred on the eastern and northern fronts into unoccupied areas of Los Padres National Forest. The fire, which had already destroyed more than 750 buildings, burned six more in Carpinteria on Sunday. It’s just 10 percent contained after burning nearly 360 square miles (930 square kilometers). Officials say the blaze, which broke out a week ago in neighboring Ventura County, is now the 5th largest in California history.